This page gives information about weather station radiation shields. A well-designed radiation shield will reduce the temperature error or excess heating caused by the sun shining directly on the temperature sensing element. There are two types of shields, naturally ventilated and forced ventilated. A popular naturally ventilated radiation shield design is the Gill Multi-Plate Radiation Shield that protects temperature and relative humidity sensors from error-producing solar radiation and precipitation. One widely-used commercial Gill Multi-Plate Radiation Shield is the R. M. Young Co. Model 41003. To see a picture, go to the R.M.Young Web Page and then select "products" and go down to "solar radiation shields". - Good air circulation around shield. - Away from large masses (buildings, masts, solar panels) especially metal items. - Away from exhaust vents, electrical machinery and motors. - Away from water fountains and sprinklers. This table gives the temperature rise for this type of shield measured under controlled conditions in a wind tunnel. The data is summarized from "Comparison Testing of Selected Naturally Ventilated Radiation Shields" by Gerald C. Gill, September 1983. Case A is for sun angle approximately 70 degrees above horizon with radiation intensity of 1080 W/sq.meter. Case B is sun directly overhead with radiation intensity of 1080 W/sq.meter or sun 10 to 20 degrees above horizon with radiation intensity 760 - 980 W/sq.meter. It is not too difficult to construct a naturally ventilated radiation shield that gives good performance. A week long side-by-side comparison of: 1) the sealed 1-Wire weather station white plastic housing; 2) the Model 41002 shield above; and 3) the home made shield in the list below was carried in the early fall in Colorado. The maximum difference between the 1-Wire housing and the Model 41002 was 16.2 deg F, and the week-long average absolute difference was 3.7 deg F. The same numbers for the simple home made shield and the model 41002 were 4 deg F max difference and 0.8 deg F average difference. So, even relatively simple designs can greatly reduce the error that a sealed enclosure would have. These links are to reports on solar heating of radiation shields. This is a collection of home made radiation shields and enclosures. Thin aluminum - Naturally ventilated shield used in the week long comparison above. Click on temperature shield and page down. Plastic Bowls - Naturally ventilated shield with a nice professional look. Made from inexpensive and widely available parts. 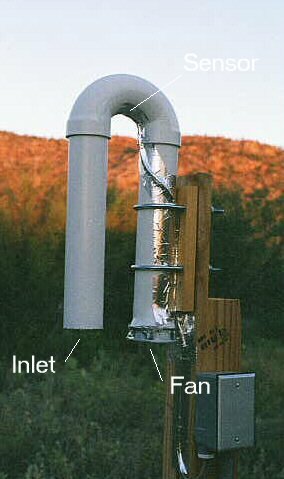 2" PVC pipe - Forced ventilated shield designed for the Arizona desert where natural ventilation may not be sufficient. Humidity Sensor Housing - Complete description, with plans to build an enclosure/holder for the 1-Wire humidity sensor. 1-Wire Weather Station - Pictures of different components of a weather station with homemade radiation shield. Stevenson Screen - Complete description of how to build one. Stevenson Screen - Pictures of a Stevenson Screen construction project. Forced ventilated radiation shield - From Greece with 13 pictures. Inexpensive ventilated radiation shield - From Oregon with 9 pictures.